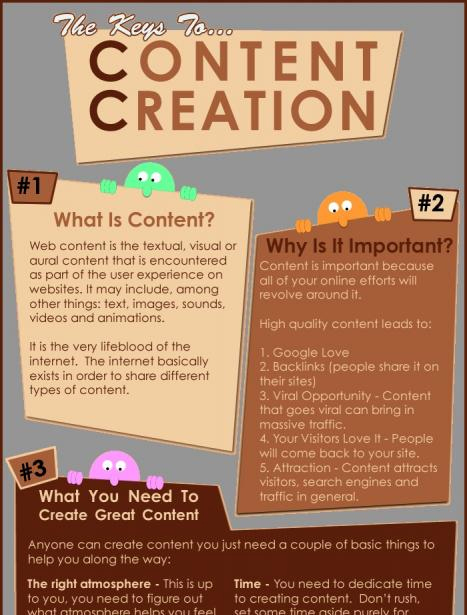 SEO Content Creation Tips Infographic | Orange County SEO Company, Inc. Content marketing is an important field in the SEO world. It allows you to use what is on your website to attract visitors who will hopefully become customers through a process known as “conversion.” Conversion is what happens when a casual visitor to your site is intrigued and influenced to buy something or retain your services. Conversion is not a magical, random thing; it happens because of good content marketing strategies that lead visitors into a purchasing situation and help them make the decision to buy. If you are considering content marketing, this infographic gives you good, basic information on how creating good content happens. By answering basic questions, you can begin to think about the place of good content in your overall advertising strategy and how you will incorporate the right content into your website. What is content? It is everything on the internet, including words, visual images such as pictures and infographics, videos, and audio files. Sharing content happens every second of the day, especially through social media outlets. What is so important about content? It is not enough to simply put up a website. You have to have something on that website that attracts viewers and tells the search engines that your site is worthy of notice. The better your content, the better your chances that people will visit and re-visit your website and share it with their friends and family. Good content also raises your value in the sight of search engine spiders that then give you a higher ranking. How do you create effective content? Your own brain is the best source of original and quality content. Your ideas are original and other people want to see them. Observation as well as your own experiences give you a unique perspective that can be shared with others. You can also borrow ideas from others, but be sure to write about them from your own point of view. Original content is key to getting Google, Bing and other search engines to value your web pages highly. Copied content sends a red flag to the search engines and will hurt your overall rankings. Continue to look for new sources of information and put them out in unique and interesting ways. Someone will notice if your content is high-quality! Do what you are good at. If your strength is creating images, focus on images. If you are a good writer, write. If you create videos, put up new ones. There is a learning curve involved, so never be afraid to try something new. If it does not work, you can always do something different! The key to creating engaging content and building a following is to always be willing to try new things but to be true to yourself and your ideas.